There are so many great new features on the 2016 Honda Odyssey, and so many reasons to buy one, that you owe it to yourself and your family to test-drive it now at Ceilidh Honda, NS. You ought to see its 248-hp 3.5L V-6 with cylinder deactivation and fuel injection move along the highway; you should bask in its eight-person luxurious interior; you need to check out the amazing built-in vacuum cleaning system in the cargo area. See all of the above, and many more dazzling features of the 2016 Odyssey, at Ceilidh Honda, NS, where your satisfaction means a great deal! We have a large selection of new Odysseys for your approval, including the elusive Honda Odyssey Touring Elite with a 12-speaker Premium 650-Watt Audio System with 12 Speakers, and both a USB port and a 115-volt AC power outlet. If you want some good clean fun the whole family will really enjoy, buy a 2016 Honda Odyssey and fill up the tank. As mentioned, there are so many reasons to buy the new Odyssey, we can only mention the highlights below. But please don't buy it just for the innovative and exclusive built-in HondaVAC® vacuum cleaner, because in a few years, all minivans will have them. Not only is the 2016 Honda Odyssey impressive-looking and fuel-efficient (courtesy of its cylinder-deactivation device), it is filled to the brim with cutting-edge Honda safety features like dual-stage smart airbags that deploy intelligently to avoid airbag injuries, and active safety features like Lane Departure Warning, Adaptive Cruise Control, Road Departure Mitigation, Forward Collision Warning System, Collision Mitigation Braking System™ (CMBS™), Lane Keeping Assist System, and a Rearview Camera with Dynamic Guidelines. Finally, the standard and brilliant jewel-like Daytime Running Lights make your Odyssey more visible to other drivers, as well as more beautiful. This year's Honda Odyssey boasts headlights with darkened trim, striking LED taillights, and your choice of dramatic eye-catching wheels. The front fascia, hood and grille have all been restyled. Now the Odyssey's distinctive lightning bolt side window accents really make sense. It's not boring, boxy or lumbering, like most other minivans around, and it gives you a fresh take on the minivan's most prized asset, the side doors. The 2016 Honda Odyssey Smart entry system allows you to open the sliding side doors just by standing nearby, without fishing the keys out of your pocket or purse. One visit to our comfortable showroom at 393 Westville Rd in New Glasgow, NS, will show you that we go the extra mile to get you in a Honda vehicle that is perfect for your lifestyle, and your budget. 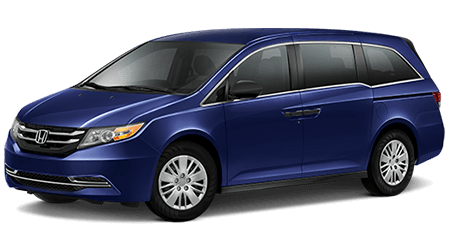 If you live in or near our sister cities of Antigonish, and New Glasgow, and you have a family, you owe it yourself to see the 2016 Honda Odyssey in all its family-friendly glory at Ceilidh Honda, NS.